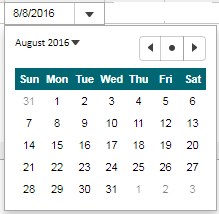 I use FlexGrid with GroupBy() to display data, and inside FlexGrid, have one column bind template InputDate(). other row, if i click the cell, the control won't display. Since you have handled ItemFormatter and OnClientBeginningEdit event, these may be the cause. If you may share a demo sample or code snippets it would be helpful for investigation. don't think it because ItemFormatter and OnClientBeginningEdit event, i tried in ComponentOne MvcExplorer, it same issue, please refer to following GIF. We are extremely for the delayed response on this thread. We are able to replicate the issue at our end and it seems a bug. Hence, this issue has been forwarded to the concerned team for further investigation with tracking id 337291. We will let you know as we get an update on this. Hi, may i know any update about this issue? or any workaround? HI Manish, may i know what is step to make it work in MvcExplorer ? Hi Manish, I only replace C1.Web.Mvc.dll, then it work fine. thank you very much. Thank you for notifying. We are glad to know that your issue has been resolved.